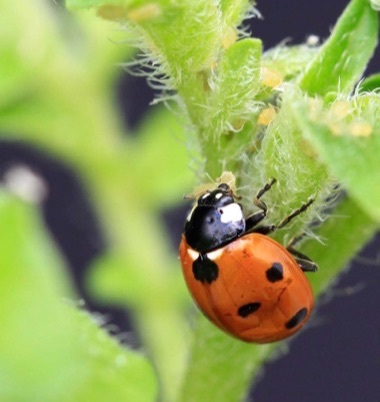 But an international team of scientists found that natural habitat surrounding farm fields is not always an effective pest-control tool for farmers worldwide. Their analysis, led by researchers at UC Davis, appears in the July 30 edition of the Proceedings of the National Academy of Sciences (PNAS). Among the dozens of scientists who contributed their field research databases to the analysis are two UC Santa Cruz professors of environmental studies: Stacy Philpott and Deborah Letourneau. “There’s a widespread assumption among ecologists that when you have more natural habitat around farm fields you get more enemies of the crop pests, and that these enemies will control the pests and provide a benefit to growers,” said lead author Daniel Karp, an assistant professor in the UC Davis Department of Wildlife, Fish and Conservation Biology. To test that assumption, Karp and Rebecca Chaplin-Kramer of the Natural Capital Project at Stanford University organized an international team of ecologists, economists, and practitioners at the National Socio-Environmental Synthesis Center. Together, they compiled the largest pest-control dataset of its kind, encompassing 132 studies from more than 6,700 sites in 31 countries worldwide — from California farmlands to tropical cacao plantations and European wheat fields. The strength of the findings is rooted in part in the size of the pest-control database, which Karp and his team of 153 co-authors have made publicly available, opening the door for further scientific insights. "This shows the power of collaboration in scientific research," noted Philpott. "Many of us were surprised by the findings. Now, we will be able to continue the investigation, learn more, and hopefully be able to predict when surrounding habitat helps control pests and when it doesn't."